There are few theories about where elves come from, according to the Icelandic folktales. The one most commonly cited, describes God’s journey to Paradise. He visits Adam and Eve, who salute him and show him how they live. They introduce him to the kids, but leave out the dirty ones. God knows about this and states, that what is to be hidden from him, shall also be hidden from everyone else. The unclean children then go on living in hills and stones, and their descendants are what we call elves. There are more stories about elves and their origin, all referring to some Bible events in one way or another. My favorite is a bit strange. It includes Adam and Eve, like the one mentioned above, but takes another approach. It describes their relationship problem. I have re-written this story as a two-hander play. I call it Trouble in Paradise and have very high hopes that it will one day reach Broadway. The scene starts with Eve entering the room. Adam is lying on a bed of roses, running his index finger suggestively over Eve’s side of the bed. ADAM: Hello, cupcakes! How about getting naked? EVE: You mean lose the fig leaf? EVE: Knock it off, you idiot! I’m not in the mood. ADAM: Oh, come on! You never are! Eve starts to get into the bed and goes to sleep, leaving Adam heartbroken once again. He walks away from her and talks to the audience. ADAM: This is my life. God has sentenced me to live with a frigid woman for all eternity and calls it Paradise. That’s rubbish! I’m a passionate man, who needs a flame in his life – a fire! Why didn’t he create someone like that for me? He looks at Eve, sights and then looks back to the audience. ADAM: I guess I’ll have to do with some solo-action once again. Enjoy your popcorn. Eve walks back and forth on the stage. She is furious. This morning, a bunch of babies appeared out of nowhere on their doorsteps. They all look like little versions of Adam. EVE: That bimbo you’ve been cheating with! ADAM: I promise. You are literally the only woman in my life. EVE: I don’t believe you. How do you explain the children? ADAM: A miracle of God? Eve starts throwing apples at Adam, who runs in a silly manner around the stage. A thundering voice comes from above, overwhelming both of them. It’s God. GOD: Stop this nonsense, both of you. I’ll explain what happened. Do you remember, Adam, nine months ago when you did that… guy thing? GOD (ignoring Eve): Well… some of that got into a hole in the soil. And that soil somehow got pregnant and… well… these are your children. Their descendants will be known as elves. Eve starts shouting and the throwing of apples once again and Adam seeks a shelter behind a tree. Avoiding the missiles, Adam turns his head humbly to the sky with one final question. ADAM: God. Can you tell me one thing? ADAM: Why did you make her like that? Curtains fall again. The show’s over. By the way, Gin unlike Tolkien, Icelandic elves can do nasty things. Perhaps I’ll tell you about some of them one of these days. Many Icelanders, particularly those who grew up before the island became cool, believe in the hidden folk. As a matter of fact, despite all that ice, it was once a very hot place—so hot that the residents bake rye bread by burying it in a hole only a couple of feet deep. Many places, like the original Geysir (yes, that’s how it is spelled) are so hot that a single misstep could plunge you into boiling mud. 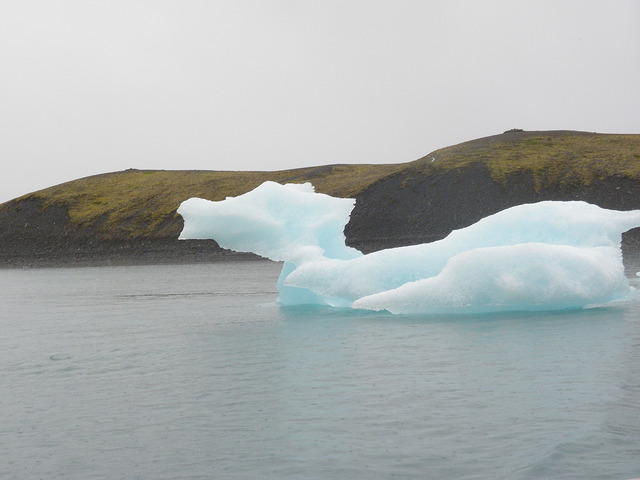 There are numerous stories about the island’s hidden folk, or huldufólk, namely trolls, ogres, elves, mermen, and others. If you think I’m being tongue-in-cheek while writing this, allow me to refer you to a story that recently hit the news in Reykjavík. 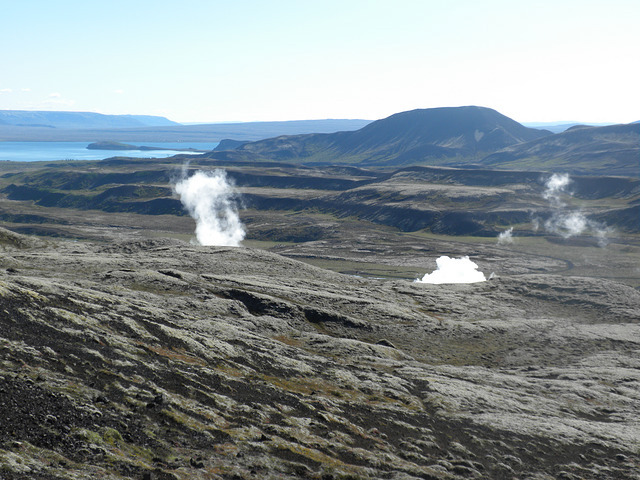 An interest group called Hraunavinir (‘Lava Friends’) is planning to sue over the making of a new road to Álftanes from Engidalur in Garðabær, across the lava field Gálgahraun, and to a roundabout opposite Bessastaðir, the presidential residence. Seer and piano instructor Erla Stefánsdóttir maintains that the elf boulder Ófeigskirkja will be destroyed in the process and fears that wrath of dwarves in the hidden world will cause accidents on the road, Fréttablaðið reports. Now this is not the type of story one would encounter in the New York Times. What I found particularly interesting was that there were some serious follow-up stories, including one just a few days ago in which one resident suggested the whole problem could be eliminated by a couple of strategically-placed roundabouts. In Reykjavík, there is even an Elfschool, which has been open for over twenty years. It is run by Magnus Skarpheðinsson, who is an expert on Iceland’s huldufólk. 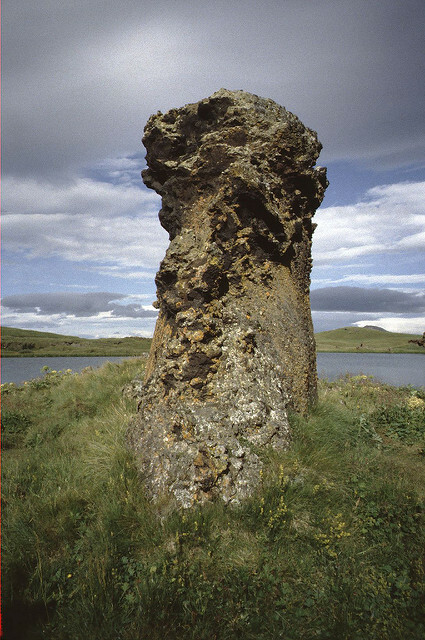 When I look at that basaltic plug in the photo above, at Dimmuborgir on the shores of Lake Mývatn in Northeast Iceland, I think that it may well be a petrified troll who hung around after sunset, or the residence of elves, who venture forth from their stony fastness to confound the ways of men.